The cruiser Méndez Núñez was a ship of the Spanish Armada built in Ferrol in 20´s and that by its design and obsolete arms and technical characteristics would be able to say that was born at the wrong time. The ship was modernized extensively between 1944 and 1949 to become antiaircraft cruiser, being reformed almost completely the covers and superstructures, and with an armament something more harmonious with its new status. Although its qualities military nothing had to they do with its counterparts of other navies due to the restrictions that sufring our country during this reconstruction, the most important assignment of the ship was forming to the future marine generations, being one of the most beloved ships of ours Armed. I decided to build this model because still being a great stranger, in my opinion is possibly one of the prettiest Spanish warships . 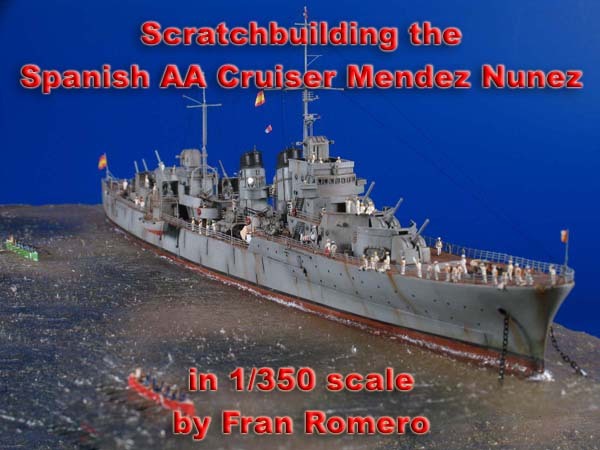 The model is reproduced in the scale 1/350, leaving from the Naval Museum of Madrid plans. Due to the little graphic information that exists of this ship, her construction was extended more than expected (10 months), in part also by the modifications suffered during the construction and that themselves they are not shown in the plans. Her construction is entirely in plastic. The vignette shows anchored during the end of its operating life, at the beginning of 60`s. To build the hull we start taking a strange way, modifying a Heller`s Colbert, reducing the long and elevating the bow. Once the hull is in correct sizes we glued the new deck in place ready for attachment of new staff. New deck and all the new components were scratching with different Evergreen items. Next step is added the fine railings (Tauro ref. 350/04) and paint the deck using different brown and sand tones, in this ship the real deck was realy dark. After painting, the deck was completely covered with masking tape for apply base color of the hull. With the finished hull started building superstructures, for this we use different types of Evergreen. Following the plans and patience this work is fun. To detail the superstructures with doors, windows, stairs etc. .. we used Tauro Models items Nº 350/06, 350/07, 350/10. After placing all photoetch apply primer and paint these parts. At this time the ship's profile begins to show its final form. Upon completion of the superstructure attached them to the ship's deck and paint the hull with the final color, now the picture of the ship is impressive. The funnels were built also in Evergreen, these were probably the most difficult pieces for me and were detailed with photoetch stairs, railings and wire pieces of different thicknesses. In the following photo shows several small pieces as boats, masts, and light weapons, which was very easy to get as it is the same used by the Kriegsmarine in ww2. With all the equipment of the ship finished and painted model preparing to put in a mold fill transparent resin to the feeling that the ship is floating. This work is convenient to do so by layers of 5 mm or less so that the heat of the resin will not break the model, each layer will give tapped applied to remove bubbles. The effect of the resin is quite realistic but needs to be done before some tests to be sure of the result. The final effect of the sea surface is performed with Woodland Scenics Water effects, applied directly on the resin and dried. After all this work put only need boarding the crew and put them in the right place to enjoy the boat regatta. Sailors are resin 1/350 L `Arsenal, and photoetch 1/350 Tom Modelworks`s. The painting of the ship is made simple just a little weathering and rust in some areas to make it realistic. The final gallery shows a real and compelling story that happened in A Coruña in 1956 during a parade Miltar and had as one of its protagonists to Mendez Nuñez A.A Cruiser. More of Fran Romero's work.